The bright flashes emitted by Japan's tiny FITSAT-1 satellite are visible from the ground. An ultra-small Japanese satellite is being spotted from the ground, thanks to a set of lights that flash brightly in Morse code. The novel cubesat, known as FITSAT-1, has been orbiting Earth since early October of last year. Though it tips the scales at less than 3 pounds (1.3 kilograms), FITSAT-1's powerful light-emitting diodes (LEDs) make it a compelling target for skywatchers. FITSAT-1 was built at Japan’s Fukuoka Institute of Technology. The tiny spacecraft is also called Niwaka, after "Hakata Niwaka," an improvised performance of traditional Japanese comedies with masks. To cast FITSAT-1 and two other cubesats off into space, Hoshide used the Small Satellite Orbital Deployer that was attached to the Japanese Kibo module’s robotic arm. FITSAT-1’s orbit is taking it between 51.6 degrees south latitude and 51.6 degrees north latitude. The cubesat contains a neodymium magnet that forces it to point always to magnetic north, like a compass. Flashing FITSAT-1 was built by Japan’s Fukuoka Institute of Technology. A successful test of FITSAT-1's LED optical beacon took place over Japan on December 11. "All functions of FITSAT-1 are sound and work very well," said Takushi Tanaka, leader of the project at the Fukuoka Institute of Technology. Images of the blinking FITSAT-1 have been taken in Japan, Germany and the United States, Tanaka told SPACE.com. The tiny spacecraft has succeeded in its primary goal of investigating optical communication techniques for satellites, he said. For Niwaka to be visible, the night sky must be dark enough that a ground observer can see the Milky Way, Tanaka has said. Also, many people are unaware that they have succeeded in photographing the fleeting, flashing light until they've magnified and closely inspected their images. The FITSAT-1 team attempts to accommodate skywatchers who want to catch a glimpse of the little satellite. "As observing the light is not so easy, we will flash the light on requests. If you have a plan for observing the light, please advise me [of] the time and date with your latitude and longitude," Tanaka wrote on the FITSAT-1 website. "Now we have a plan for flashing at 09:25:00 on 9th Feb. for the west coast of USA." Tanaka is no aerospace specialist. He's a professor of computer science and engineering, with research interests that specialize in artificial intelligence, language processing, logic programming and robot soccer, in addition to cubesats. "Most cubesats are developed by some kind of space department of a university, while FITSAT-1 is developed by amateurs of space." Tanaka said. "Though I do not have much knowledge about space," he added, "I am a ham radio [devotee] since the age of the vacuum tube." 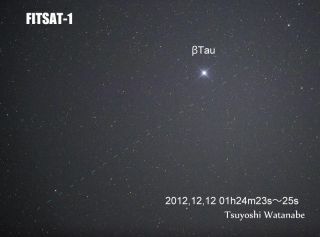 Editor's Note: If you capture a great photo of Japan's FITSAT-1 in the night sky, or any other stargazing sight, and want to share it with SPACE.com, send the images, comments and your name and viewing location to managing editor Tariq Malik at: spacephotos@space.com.